We recieved this encouraging comment on our Facebook page from Wayne Melquist, a long time osprey researcher in Idaho...it just made my day so I had to share it! Knowing that other researchers see the value in my efforts, makes all the hard work and uphill battles worth it! 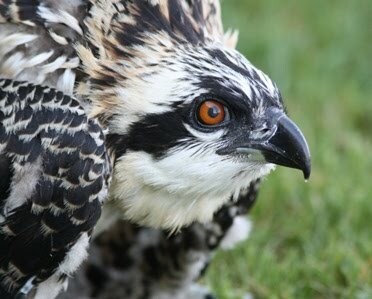 "Well done and the information you folks are gathering is redefining some of our assumptions on osprey ecology! I just wish we had had today's "tools" back in the early 1970s when I first started working on ospreys. My hat is off to all you dedicated osprey watchers. Being from Minnesota and Wisconsin (born in Minneapolis), I'll have to check in with you all during one of my trips back to visit family. Best of luck and keep up the great work!" Today I visited many nests, checking for successful fledging of the chicks. One nest I visited had previously held three chicks, but today I only saw two in the nest. Did we lose one here? Could one have fledged? Perhaps, but my search around the nest area revealed no other chick. I proceeded onto to the next nest, which was very close to the first nest. I found a single chick there, as there had been last time I visited. The male chick stood quietly, watching everything in his world, and then the adult male arrived carrying a fish, and right behind him was another screaming juvenile! I had never seen two chicks on this nest previously, and one was missing from the neighboring nest. Hmmmmmmmm. I have seen a chick move from one of these nests to another in the past, so I pondered that possibility. If the chicks had been banded I would know for sure, but since they weren't, I could only contemplate that possibility, as I chuckled. One thing many of my volunteer monitors are noticing this time of year, as the young ones take flight, is that suddenly some of the females may be harder to find. They have remained steadfastly with their eggs, their chicks for so many months and now our visits often find no female present. It's usually only a temporary absence, but that is a change. This is the time of year that the bonds they have felt for their offspring begin to loosen a bit and the females begin the slow, subtle preparation for migration. The females can lose muscle mass after all the incubating, shading and feeding and now they are finally able to leave the nest and fly a bit, they begin catching a fish occasionally, bathing, perching near the nest instead of on it. Of course part of the reason for clearing out is all that flapping! As the chicks jump, flap, fly from one side of the nest to the other, there is little room for adults on a nest with three chicks. The females won't leave yet, but the behaviors do change, the males are stepping up their game, fishing, watching over the youngsters, they may follow him to the favorite fishing hole. I visited a nest where the homeowner shared that the chicks began fledging yesterday. So I snuck out to the backyard, using all my best raptor approaching skills...and I recieved no alarm calls. One chick still in the nest, the adult female in a nearby tree. I stayed down low, basically on my knees, scanning with my binoculars to try to find the other two chicks. Ah, there was one perched on a bench on a neighbors dock. And I finally spotted the other one perched on a boat cover near the other neighbors dock. Then the first chick began flying all around the shore of the lake and plunging into the water, and then mustering all his strength to get lift off out of the water...only to do it again, and again. It was so much fun to watch! He was practicing his water starts, already! It was not fishing, since there was no hovering, no looking into the water....just the in and out of the water activity. Developing a very necessary skill! It was delightful to witness. Pretty sure I heard the other chick, who was watching all this, say, "wow"! Good news, bad news. I made some rounds today, partly in torrential rains....to check on the chicks. I checked seventeen nests and most had all chicks still present and accounted for after our stretch of extreme heat and humidity. One nest that had one chick nine days ago, when I last visited, had failed. One nest,that had two chicks nine days ago, had one on the nest and, sadly, one hanging dead from the side of the nest tangled in fishing line. Heart breaking. Must have happened shortly after my last visit because it was quite decomposed. On another nest where there were originally three chicks, only one remained. I believe that one of these chicks died from injuries related to baling twine. Let me reinforce the plea for people to please pick up fishing line and baling twine to prevent these tragedies. These materials kill. So fourteen nests had chicks, 2-3 on most nests, that all survived this tough week! I always tell people that it is amazing what they survive, but they are built for this, made for sitting out in the sun, in the rain, in the open, and they handle it all much better than I do! I thought I would find more chicks fledged than I did, but perhaps the wet weather caused fledglings to just stick to the nest today. I try to confirm successful fledging, and I will visit all these nests again, but sometimes I have to settle for confirming that they survived to fledging age. With so many nests to watch over now, I simply can't get to all of them as much as would like. As the population grows we have an increasing need for good volunteer monitors that will make a commitment to watching some nests thru the breeding season and sharing their observations with me weekly. Skilled birders with spotting scopes, cameras with long lenses or hi powered binoculars are especially treasured. We do have amazing volunteers who are watching so many nests, sometimes stretched so thin, and we are still getting new monitors who find out about our efforts and want to join in the fun (and work). Just got a new one last week with lots of experience with other raptors! Yeah! Thanks to all who are helping me watch over these birds. It's a labor of love, fueled by passion and curiosity, and a deep commitment to the welfare of these raptors. We are all still learning so much, sharing the joys and sorrows involved with this kind of a project. Grateful to all who pitch in to help, grateful that so many chicks are fine after the brutal weather this week. And yet, we weep for those Ospreys that have been lost, here, and around the world. Each one is precious. believe it or not they have started fledging! I saw five of the six chicks today....one that had fledged did not show up for me today, but my nest monitor, Carol, saw him on Tuesday. Another one that has fledged was flying in and out of the nest. I hope the one that fledged earlier is OK....it's scorching hot today....mid nineties with a dew point of 75. I did my best to search for that chick, but it wore me out so after three hours I had to head for some AC. The other nest had all three chicks present and one was going between the nest perch and the nest but I never actually saw him make his move so am not sure if he was flying, hopping or just walking out on the perch. It was always the same one on the perch. There I was trying to watch both nests at the same time, and take notes, and no matter where I looked, I was missing something! The VIB ( very important bird) never showed up! The male! Both females were gone at one point...one came back with a fish and the other came back all wet, but with no fish. I must say a large part of the success of this story is attributable to those females. All chicks have survived to an advanced age, and that is somewhat unusual in a situation like this. So that is cause for celebration. As for any chicks, fledging can be a treacherous time and I certainly hope they all survive this next big hurdle in their development. I will keep you posted! It is brutally hot out there today, and supposed to be worse tomorrow. On the way to get my car repaired I checked some nests....at one nest I watched in amazement as three chicks were jumping, flapping furiously and then taking turns laying down, ducking when it all was too chaotic. Of course I located the adults nearby, but there was no room for them on the nest today! One of these lovely juveniles was floating straight up at least four feet above the nest and flapping as he just hung in the air for LONG periods of time! He did this over and over, remaining up in the air for 2-3 minutes at a time! The nest is in a high spot and it was windy enough that at some times he even quit flapping and literally just floated in the air. He was even practicing tucking his feet up under him and really exploring the feeling of "loft"! But each time he made his way back onto the nest without really launching off the nest and steering his first flight in a loop. It was funny and awesome to observe. If it hadn't been so hot I would have stayed longer....perhaps by now he has made his maiden voyage! I never tire of watching these winged ones...I remain in awe of them. It's amazing what these birds survive and today the birds I saw looked fine, better than me! Crops full, panting to release internal heat. They are designed for sitting in the sun. But we have several more days of brutal heat. Think good thoughts. And think good thoughts for Ceri on the DYFI nest who is struggling....we are sincerely hoping for a good outcome there. I am often puzzled by behaviors, (especially human behaviors!) but I also realize you must watch these ospreys carefully enough to even BE puzzled! I continue to observe these birds until I begin to understand the behaviors and am able to put the pieces of the puzzle together. Some times I am left with questions, and I allow those questions to remain rather than mislead anyone by jumping to an easy conclusion. I am watching two nests where the males identity has changed sometime during this breeding season. This requires repeated band reading and careful observation. Sometimes the behaviors are subtle, but are a tip off that the attending male may not be the father of the chicks. In both of these cases I notice that these males are rather scarce. They are not what I would describe as "attentive", as some males are. At first you may think, " it's bad timing of my visits". Eventually it becomes clear that it is more than that. I also see that these nests often have a lot of chaos around them....extra Ospreys flying over, circling, chirping. This is the response to an undefended or only partially defended territory. If no male is seen on or near the nest, it is a signal that the territory may be up for grabs, in spite of a female and chicks occupying the nest. The males that are trying to take over the nest almost never feed the chicks directly, shade the chicks, or stick close to them while the female takes a break. When they do bring a fish, they may drop it for the female, as a typical part of courtship behavior or they may just eat it themselves while the whole family food begs. They usually do not provide enough food to care for a large family and on one of the nests I am watching, one chick has already been lost, probably as a result of insufficient food. They may even work on the nest...bringing sticks, even sometimes placing them ON the chicks or ignoring those squatters in his nest. It's all the familiar courtship behaviors we see in the spring, with no parental attention to the chicks. Sometimes they even seem slightly aggressive towards the female. I believe these males are just trying to acquire a territory. They can see that this territory is not being defended my another male, so they move in, do what they have to regarding courtship, and quite often this strategy gains them what they want. Next year this territory will belong to them. It's all interesting to me...the more I watch the subtle interactions, the more I learn. Another puzzling situation is on a nest where I identified the two banded adults sitting comfortably side by side in a tree in April. Many return visits revealed no sign of incubation. This pair had been together for several years, so what was the problem? What was causing the delay? One day I returned, saw two adults on the nest, but noticed that the male seemed defensive, his back turned to the female, his head hanging low. Why would he act this way with his mate of several years? Hmmmmmm. So I read bands again only to discover that this was a different female! She was young, only two years old, unreceptive to copulation, probably too young to breed. Where was the territorial female? What happened to her???? I returned a week or two later to find this same young female present. I assumed that the original female had met some sad fate. I thought I should go search for her body, but didn't have time. Too many nests to watch. Then a few weeks later I returned again, and discovered the original female back on the nest! The male brought her a fish and they were standing side by side, comfortably, on the nest, with the female eating her fish. Now it is too late for egg laying so it's a failed breeding season for this pair, for reasons I cannot quite figure out. Where was this female when the other one was on the nest? This is one of those cases which will remain a mystery. If I were able to check all nests every day, perhaps I would have better insights. There may be reasons why a pair doesn't breed that we don't understand. I can theorize, but science is about documented facts and known outcomes, not guesses, estimates or theories. We can spin some good tales about what might have happened, but must carefully separate that from the facts. I can report that our first chick has fledged. Yesterday I watched a young one fly a beautiful loop and made a damn fine landing for one who is new to this. As I have said repeatedly, flying is easy, landing is hard. It's been a few days since I have visited this nest so I suspect this one has made a few loops previously. It looked to me like the sibling was still a nestling, having not ventured forth yet. At least while I was there, this chick preferred to lounge in the nest than do any jumping, flapping or flying. She was also eating a lot, ripping and tearing a fish on her own, which is an important developmental stage. However, they often eat less right before fledging. So now begins the most treacherous time of the breeding season. Things do go wrong on those first flights, young ones do land on the ground sometimes, perhaps uninjured but unable to achieve lift off from the ground. So we must visit often, count the heads often, search for fledged chicks when possible, and sometimes a rescue is required. Sadly, some serious injuries also occur at this time as these young ones are not good at steering. Sometimes listening carefully is useful for finding a grounded juvenile....I have discovered a chick on the ground by its food begging. (Unfortunately they go silent as you approach them so finding them can be a challenge!) The parents usually will not feed a chick on the ground as it may put the adult at risk of predation. They cannot get the chick safely back to the nest, nor can they stay on the ground 24/7 to protect the chick. Having said that, I did see an adult feed a chick on the ground once. It was at a nest in a gravel pit where a chick had landed on a small hill of sand. The female fed the chick there and I watched for many hours as the chick walked up higher and eventually made very short flights from one pile of sand to another and, yes, made it back to the nest! I spent about three hours planning a rescue in my head that, in the end, was not required! I love a happy ending! I really tried to have an osprey free day today....to just catch up on personal stuff, prepare for a big week ahead, get some housework and yard work done....I wondered if I could do it. I see that other people do it...even osprey lovin people do it. In the end I failed. I went out to get a few things at Target and Whole foods and next thing I knew, the car had taken a little detour, to re route me past one of my favorite nests. Oh, it was lovely. It was so quiet there today, and both parents were on the nest, attending the little guys. And the little guys....well, they had such full crops it looked as if they might explode. Their little rounded breasts were still grey and downy, probably close to three weeks of age. As they both stood up, looking out at their new world, the looked, well, happy! Perhaps I am being anthropomorphic but they truely looked satisfied and as if they were grinning! Eyes bright and rusty colored....beaks open, tongues pink. The female decided to take a little break and flew off to a nearby favorite perch. The male remained on the nest, close to the chicks. He is a great male, so dependable and attentive. This nest has been successful every year since it was first built. When I looked back at the chicks, one of them had collapsed into that common post fish coma. The other stood tall, looking around and, smiling! I swear. They may not like this evening tho. We have one nest on some Ballfield lights in a park where they shoot off fireworks and we have lost a chick this night for the past two years. We are watching closely this year. One of my great volunteers, Barb, will check the nest today and very early tomorrow, in case a chick needs rescuing. We do our best. We love these guys. We can scarcely go a day with visiting with one of our friends. Happy Fourth of July.